The last few months we’ve been talking all about simple activity ideas, using our favorite things, books, blocks, and balls. Today we’re going to wrap up these simple activities by focusing on balls! Balls have dynamics all their own: they bounce, roll when pushed, soar when thrown, move unassisted down a ramp and come to a complete stop. Because of this the dynamics of moving balls can help your child learn principles of physics and cause and effect. Drop the ball, let it bounce and then catch it. Throw the ball into the air and catch it. See how high you can throw the ball and still catch it. Throw the ball into the air and see how many times you can clap your hands before you catch it. Throw the ball against the wall and catch it. Throw the ball back and forth with a friend. Home Bowling: Using empty water or soda bottles, set up a small group of at least five bottles. Standing a few feet away, have your child roll a ball to the bottles and see how many he can know down. Make it a game with other people! Balls in the Air: Hold the corners of a small blanket with your child to create a parachute. Place balls on the blanket and throw them up, trying to catch them on the blanket. Try different sized balls to add variation. The Rhyming Ball Game: First have everyone sit in a circle. Hold a ball and say a word then roll it to the next person. The person who receives the ball then says a word that rhymes with your word. See how many words the circle can come up with, before picking a new word and starting again. When you’re at Discovery Gateway next, be sure to have a ball in the Beehive exhibit in the Garden, the Magnet Wall in the STEAM Studio, the New Move It exhibit, and more! With a full summer ahead, I’m sure you’re wondering “How do I keep my kids entertained?” In a child’s eyes, summer can be full of freedom and fun. The last thing you want your kids to do is spend all this free time glued to the TV! Summer can be an amazing time to encourage kids to explore, try new things, build relationships, continue learning, and so much more. It’s important to utilize this time with you children. Research shows that many children will lose some of the knowledge gained during the school year, during the summer months. It’s vitally important for kids to keep learning during this break from school. As a parent you can facilitate this in a lot of different ways! Here’s some great ideas to keep your youngsters learning and growing all summer long. These are a great resource in which kids can learn from structured activities that are a lot of fun, not to mention educational. There are hundreds of resources throughout Utah for summer camps, depending on interest, price, and length of time. Learn how to HACK, DESIGN, CODE & MAKE using technology and computer science. Any level of interest and experience is welcome. Learn all about the moviemaking process through the science of lighting and sound design, and the art of costumes and scenery. Write, direct, design and perform your own short movie with your fellow campers! Get ready for your big debut during the movie premier on Friday night with parents and guardians in the audience! You can find nearly every other summer camp out there by visiting this site! On your mark, get set, READ! Connect with your libraries summer reading program, not only can you read some great books. Many libraries also have weekly activities for your family to enjoy! Find your local library here. Free summer lunches are happening across the state at a variety of locations. These lunches provide nutritious food and a chance to socialize with your community. Find the closest one to you by clicking here. There are lots of other great activities going on within your community all summer long. Click here to find some of our favorite summer activities around the state. Play Unplugged! Spend time having fun, exploring, and connecting with agencies in your community by collecting Brag Badges with your children. This is a fun and free way to keep busy and try new things! Find more info here. Check out Help Me Grow Utah’s Pinterest, Facebook, and Instagram for ongoing activity ideas throughout the summer. Have even more questions about how to keep your summer fun for the whole family? Contact Help Me Grow Utah by visiting our website or dialing 2-1-1 and asking for Help Me Grow. Blocks–Building More Than You Realize! Picture this–You’ve just bought your child a great new toy. It’s fun, it’s colorful, and it’s supposed to be great for their development! You are so excited to pull it out and start the fun! But the next thing you know your child is playing with the empty box it came in and having the time of his life. Does this experience sound familiar? I can’t tell you how many times I have heard this type of story from parents! Children are curious beings and can make toys out of just about anything. Because of this some of our favorite toys to suggest to parents are a simple set of wooden blocks. While playing with blocks, children learn all about counting, equality, addition, subtraction, planning, patterns, volume, classification, area and measurement. When parents engage with their child in block play it also provides teaching moments for social skills, language and exploration. Make your own blocks: Using standard size boxes (milk cartons, capri sun, etc.) you can make blocks by covering them with sturdy wrapping paper or contact paper. Allow your child to guide the activity and discuss the sizes as you create the blocks. Create your home: Have your child look at the neighborhood and your home. Help them build a structure like your home. Make sure you take pictures and show off your child’s work whenever friends or family are around. Knock ’Em Down: Margarine tubs are best for this. Children stack them up, then with flourish, knock them down. Of course, everyone applauds. Then you do it all over again. Kids love it! Ramp It: Create a variety of ramps with blocks. Roll a small ball down the ramps. Which incline makes the ball roll slower? Faster? Making Patterns: Provide blocks of different shapes or colors. Create a pattern for children to repeat, such as square, rectangle, square, rectangle or red, blue, red, blue. Ask children to create new patterns for you to repeat. Visit Discovery Gateway’s Block Party Exhibit: Children can build amazing structures from floor to ceiling with the giant blue blocks, connecting parts into the gallery walls, and transforming the space with power of their imaginations. Trent Nelson | The Salt Lake Tribune Lily Edmondson plays in the new Imagination Playground Block Party at Discovery Gateway Children’s Museum in Salt Lake City, Thursday October 1, 2015. Childhood is a celebration every day, but did you know that once a year we actually have a whole week dedicated to it? April 10 – 16 has been declared by the National Association for the Education of Young Children as the Week of the Young Child. During this week especially parents and families can make a special effort to celebrate the youngsters that surround us! Here are a few ideas from the National Association for the Education of Young Children to make the most of this special week! Through music, children develop math, language, and literacy skills – All while having fun and being active! Find the beat to connect music, movement, and math. Practice clapping, drumming, or stomping to the beat of the music while counting. Cooking together connects math with literacy skills, science, and more. Measure your ingredients while making your tacos! Ask children if they’d like the same or different amounts of each ingredient. When children build together they explore math and science concepts and develop their social and early literacy skills. Practice organizing blocks by size! Try building a block tower with large blocks on the bottom and little blocks on top! Children develop creativity, social skills and fine motor skills with open-ended art projects where they can make choices, use their imaginations, and create with their hands. Bring art outdoors! Offer dark and light paper, chalk and pastels, and suggest children create their own versions of the day and night sky! Engaging and celebrating families is at the heart of supporting our youngest learners. Have a Family Friday breakfast, where you and your children can prepare and share breakfast treats while sharing memories! To celebrate the Week of the Young Child Discovery Gateway Children’s Museum, Help Me Grow Utah, and other community partners are having an April Baby Shower! Bring your youngest learners and enjoy fun and interactive party activities including a ball pit, sensory wall and crawl, hand-print art, and giant bubbles! Join us at Discovery Gateway April 14, from 12pm to 4pm. Free admission for children ages 0-36 months. Some of the simplest toys can bring the greatest growth. At Help Me Grow Utah, some of our favorite toys are books, balls, and blocks. Today we’re going to talk all about books! Books build communication, problem solving, and imagination skills. These are vital skills that your child needs for school readiness and life! Go on a reading campout. Build a tent in your living room or backyard. Ask your child to bring his or her favorite books and stuffed animals. Grab some flashlights and read together. Find a recipe online or in a cookbook. Read the recipe out loud together and follow the instructions to cook something delicious. Have a reading scavenger hunt. Choose a letter of the alphabet and talk about the sounds it makes. Go on a walk around your house, neighborhood, or children’s museum and find as many things as you can that start with that letter. Make your own book. Using photographs and your child’s drawings, make a picture book together. Write the words to the story and then read your book together. Put on a puppet show. Choose one of your child’s favorite books and read it together. Then make puppets out of socks or brown lunch bags. Act out the story for family or friends. Help Me Grow Utah has hundreds of age appropriate activity ideas for parents at no cost! You can learn more by calling 801-691-5322. Your Child’s Development Starts Before Birth! We are always using the term early childhood, but when does early childhood really start? 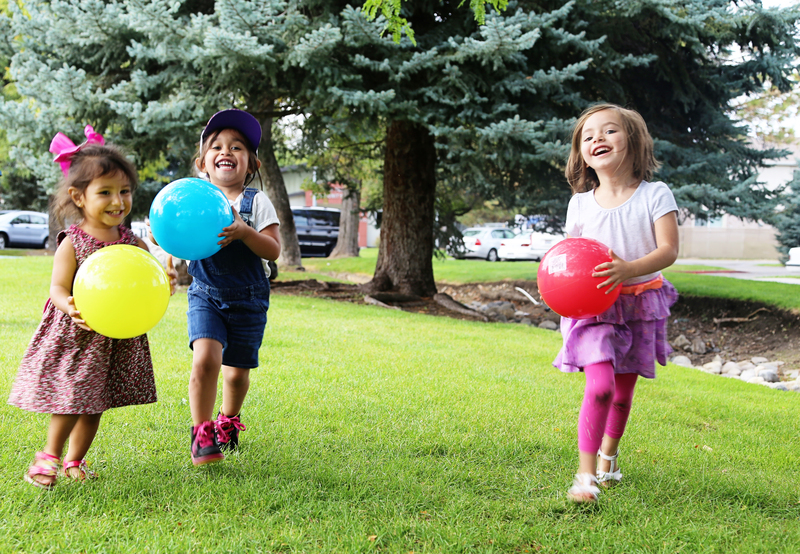 Here at Help Me Grow Utah we are hoping to expand our realm of early childhood! Because of that we’ve made some big changes in the past month! Not only have we updated our marketing with a new look, but we have also expanded our services to include prenatal families. We could not be more excited to help families connect to information and resources during this incredible time! Why do we feel like pregnancy is such an important time to support families? Because so many incredible things are happening during those nine months! During pregnancy your baby is developing all of the physical components he will need to function in the world. There’s a lot that happens in between the single cell they start as and the newborn baby you take home! We can help you understand how your baby’s brain and body are developing throughout your pregnancy and what you can do to support that development. As a mom your body is going to go through incredible changes! Some you may be familiar with and some may seem a little off the wall. For example, did you know that during pregnancy your sense of smell increases? Along with the physical changes you will experience there are a lot of emotional changes during and after pregnancy. We want to help you understand all of these changes and to know that you are not alone! Whether it’s your first pregnancy, or your last, having a baby will bring big changes to your life! It can be helpful to talk about how your bundle of joy will affect your home, family, and work life. Did you know there are also a lot of great ways you and your family can start bonding with baby before she is born! Help Me Grow is ready to help you through the exciting times and the scary, to help get you the answers and community connections you need for your family. Starting your baby’s development off right from the very start is one of the best things you can do for your child’s development! A healthy pregnancy prepares you and your child for the exciting journey of childhood. If you or someone you know is interested in receiving more support along the way, call us at 801-691-5322 or visit http://bit.ly/ConnectWithHMG to talk to a trained Care Coordinator. As we all know the start of the New Year generally means new goals, new experiences, and a new sense of determination. For me and my family, it’s also a time to reflect on the past year and dream big for the year to come. We love to reminisce about the happy times, talk about how much we’ve grown because of the hard times, and smile at all the times that brought laughter to our lives. We do a lot of fun and memorable things as a family, but sometimes they can get lost in the bustle of everyday life if we don’t record them. One of my personal goals this year is to record and focus on the good experiences I’ll have throughout the year. Doing something like this is a great way to get your children involved in keeping the history of your family. Make sure you help them record things that are important to them. I’m sure they will begin to love putting memories into the jar as much as they will love reading them at the end of the year! Have any of you tried a memory jar before or something similar? How did it work for your family? We’d love to hear your thoughts!